Sunderland responded to their first defeat in the league with aplomb last weekend against a solid Rochdale side. Can they start to gain a bit of momentum by following those three points with another win agaisnt Coventry? Let's have a look. It's time to silence the doubters. Jack Ross's side put four past Rochdale in a sublime return to winning ways. If his side manage to back the result up with another win then surely Sunderland will be recognised as a force to be reckoned with and title contenders for League One. The lads played some nice football with Josh Maja and Lynden Gooch bagging a brace each. If Ross' silky passing game comes to the fore again it could well be a long afternoon for Coventry. Last time out the Sky Blues came undone in 16 minutes, conceding 3 first half goals. But that result doesn't do justice to a well organised team who inflicted a 1-0 defeat on promotion pushing Barnsley. Mark Robbins is no stranger to the demands of League One and will be expecting a positive reaction from his side. They'll be hoping to improve on the 11 points they've plundered so far. Sunderland will be a real test of character for Coventry with 5000 supporters travelling to the Ricoh Arena, which is in all honesty absolutely sensational for league 1. In a week dominated by the news of the termination of Didier N'dong's contract, Ross has spoke of how the Gabonese international was not a part of his plans for the season, nor was he ever going to be incorporated into them. And since he's proved to be a disloyal, unprofessional parasite to the club, I'm not going to waste my words or your time any further by discussing him. Ross has spoke of his team handling the weight of expectation and how they responded so positively to their defeat at the hands of Burton. There was also the added caveat of Duncan Watmore being back in the frame. It just seems the good news doesn't stop for the Black Cats and their long awaited revival. I’ve always been acutely aware of not just the expectations, but everything that goes along with managing this club. It didn’t completely surprise me, but again, I think it was just to see it first hand because you can think about it and think it’s there, but you don’t know it until it actually comes around. It’s important to stress that the supporters have been incredibly supportive with what I’ve tried to do at the club. It certainly wasn’t even within games that they were being critical, I just think it was that overall feeling around the whole club. We’ve drawn a couple of games and we’ve lost one, it’s a disaster. We want to win every single week, but in reality, that’s not always going to happen. So, it’s how we cope with the challenge that comes along when we don’t win and the good thing for me was that the response of the players was good in training and was great last Saturday. Mark Robins on the other hand is hoping his players find the form which saw them defeat Barnsley. He fully expects his side to be competitive and go for the full three points on Saturday. The biggest problem with this Coventry side is that they don't have a finisher and are missing last season's hero Marc McNulty. The 26 year old bagged 28 goals in 52 appearances last season for the Sky Blues and since he left no one has taken on the responsibility of putting the ball into the back of the net. Mark Robins' side have only managed 7 goals this season and that will be a real worry for the home side. 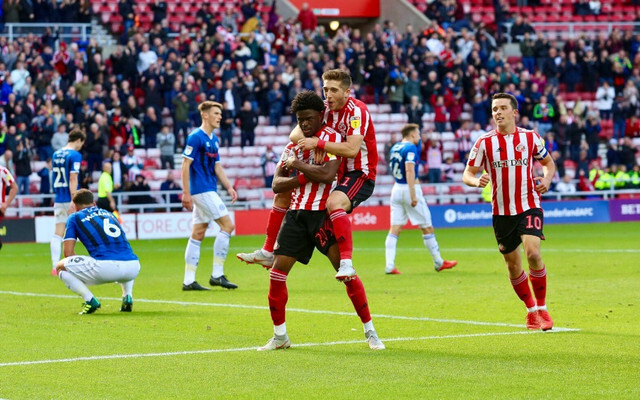 With Josh Maja topping the League One scoring stats with the same amount of goals that Coventry City have managed this season, Sunderland will arrive full of confidence that they can secure a second successive win. Using the pace and width of Gooch and Denver Hume should provide ample room for Chris Maguire and Maja to cause absolute havoc in and around the Coventry area. Robin’s side don't like pace or width coming at them as was seen against Barnsley where they were stretched a number of times. Surely Jack Ross will be reminding his team that being patient provides opportunities and with the devastating form Maja is in goals will follow. I've been far from accurate with what I've been expecting to happen on match days. But the positive vibe and the good form our team finds itself in seems to show that another win could be on the horizon. I hope no one is putting my predictions in their weekend 17 fold acca for 265,000 pounds. But I'm going to go for a 3-0 win, with Gooch to get another assist to take him joint top of the charts and Maja to score and continue his imperious form.